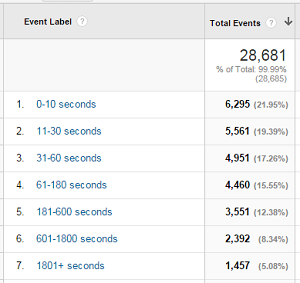 What is bounce rate in Google Analytics? Is higher or lower better? What is typical? Does it affect my search engine rankings? The first problem with this calculation is that it uses the metric ‘sessions’, and a session ‘count’ is associated with the first hit of a session. If you are looking at website overviews, it doesn’t matter, but most people are concerned about the bounce rate of individual pages. If the session starts with an event, even a non-interaction event, the session ‘count’ for the first page is actually zero [this scenario can occur if a device comes out of sleep and an event fires on the page it had loaded; a new session is started and the first hit is the event (see Sessions for Pages)]. The result is that the the number of sessions could be under-reported. The second problem with the calculation is the definition of ‘bounces’: “The total number of single page (or single interaction hit) sessions” . Notice that the definition says NOTHING about how long the person spent looking at the page; that is because in Google Analytics the times are calculated between page views, and with only one page…well, the time is zero! (see Time on Page/Session Duration). People can read your entire page, spending 5, 10 or 15 minutes reading every word, but if they don’t click to another page on your site, Google Analytics considers it to be a bounce with a Session Duration of 0. This has created a discussion about the need for an “adjusted” bounce rate — one that indicates only the dis-engaged visitors to your page. There are many opinions and approaches to this, but all involve adding code to your website and there is no consensus on the definition or thresholds to use. The technique I use allows you to track the actual time spent on every page in a way that is easily seen in standard reports (see Time on Bounce Pages). 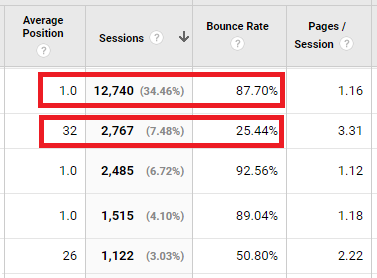 So the bounce rate reflects the percentage of visitors that only looked at one page, and might be a bit over-reported if your website uses a lot of page-level events. It does not provide a good reporting of the engagement or satisfaction people had with the page; it only shows that the page did not draw the website visitor in to other pages on your site. Bounce rate is usually referenced by search engine optimization professional as an indicator of search performance — did the customer see your page and ‘bounce’ back to search? But that is not what the Google Analytics bounce rate measures — it does not measure the time on your page, or indicate the visitor went back to search afterwards. It just shows you didn’t get them to view a second page on your site. 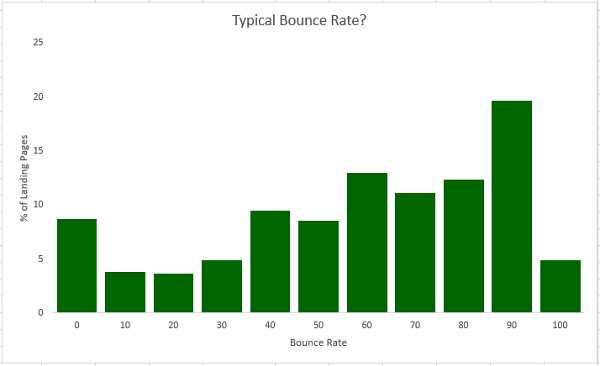 What is a typical bounce rate? Typical values for bounce rate depend on the page itself: navigation-centric pages can hover around 0 (people almost always click to another page with content), while ‘sticky’ landing pages with no navigation links will have 100% bounce rates. A lot of pages, especially blog articles, tend to hover above 80% unless you make an effort to direct the reader to another page. “Good” landing pages are around the 50% mark. This chart shows the bounce rates of the top landing pages from a hundred random websites. Above all, remember that getting lots of traffic from people that are not interested in your content will make it impossible to lower your bounce rate — do not use ‘tricks’ to get people to click to your site unless you have the content they expect to find. One common problem people experience is bounce rates hovering around 1%, and this is usually caused by website errors. Either the Google Analytics tracking code has been added twice on the page or there is an auto-redirect occurring . In the case of duplicate tracking code, you will see inflated (almost double) sessions and page views as well. Does it affect my website traffic or rankings? Some people feel a high bounce rate might affect the number of visitors your site gets, but the real answer is more complicated. If the page satisfies the reader’s interest, then chances are the traffic and rankings will come. If they keep looking for a better answer, then you will probably see things drop. In both cases, the page can have a high bounce rate. Bounce rate alone is not a good indicator. Google has repeatedly stated that they do not use any Google Analytics data for ranking. 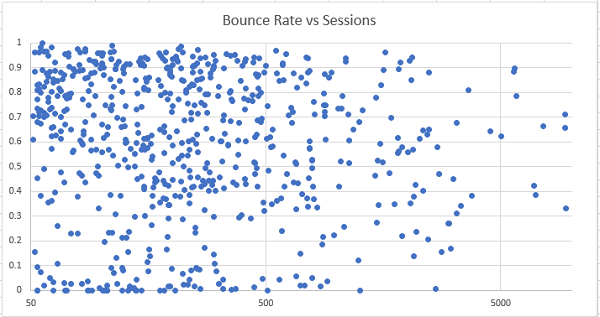 Looking at the same sample of pages used above, the next chart shows that bounce rate is not related to the raw number of sessions that a page may get. The bounce rate of a page does not necessarily affect the volume of views the page will get. However, some recent studies have shown the average bounce rates of top ranking pages are around 50%, but averages can be misleading. You will also find it possible to get high ranking pages with high bounce rates, as well as low ranking pages with low bounce rates (as shown below). As a parting note, do not get hung up on the bounce rate — it is a very poor Key Performance Indicator since it can be subject to so many influences that have nothing to do with ‘performance’ of your website or ‘engagement’ of your pages. It is a supplementary metric — one that can be used in conjunction with other metrics to form a whole picture of how a page is being used. This entry was posted in Google Analytics on 2017/10/20 by articles.